Only reheat pork chops one time. You walk a fine line between overcooking and safely reheating when warming up leftover pork chops, because you have to reheat all meat to 165 degrees Fahrenheit for safe consumption. Steam reheats food more gently than any other medium. But when you use steam, you have to keep the heat source between 180 and 200 F and check the chops' internal temperature with a meat thermometer to get it right. Heat the oven to 180 F or adjust it to the "Warm" setting, if it has one. Bring about a quart of water to a boil in a pot and place a wire baking rack in a shallow baking dish. Pour the boiling water in the shallow dish until it reaches just below the bottom of the wire rack. Place the pork chops on the rack in an even layer, then cover the dish tightly with aluminum foil. Carefully place the dish in the oven without spilling the hot water. 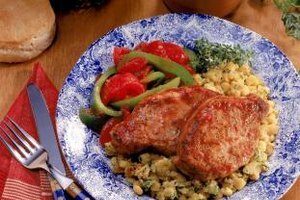 Reheat the pork chops until they reach an internal temperature of 165 degrees Fahrenheit, or for about 20 minutes.